As I approach graduation, I have been reflecting more on what it is I want in life, and especially in a career. It is not so much about what I can do, but if it is the right choice for me. There is so much out there for me to explore, and I would like to take the time to do that. I don’t want to jump into any one career or graduate program without being completely content in my decision. I would like to first find a job related to my degree in health sciences. This can be anywhere from research to administration, ideally with a focus on public health efforts. 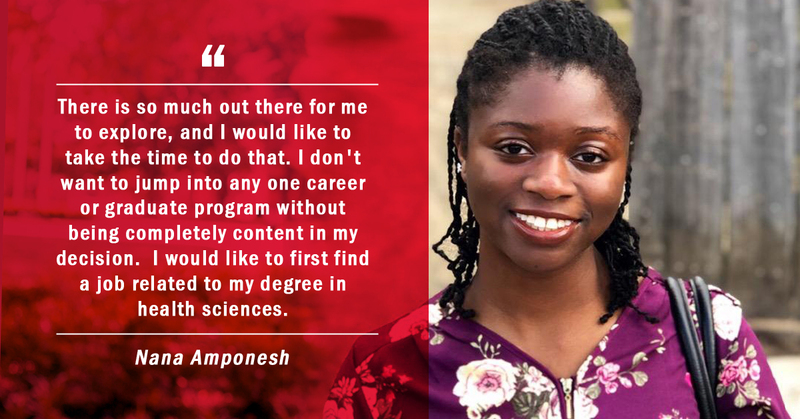 I would like to gain experience and knowledge during that time–especially if I were able to work with patients/clients and members of a healthcare team–to have a better idea of what career would best suit me. So, whether I decide to become a physician assistant, nurse, doctor, dentist, or even look towards an administrative role, I would confidently make that decision when the time comes. Page last updated by Health Sciences at 3:58 pm April 15, 2019 . This page was printed from http://healthsciences.camden.rutgers.edu/2019/04/15/nana-amponesh-rutgers-health-sciences-testimonial/ at 8:53 PM Saturday, April 20, 2019.